The Frugal Family Life: Rare $.55/1 Joy Cone Coupon + Walmart Scenario!! My hubby is an ice cream cone fanatic, so he's going to love that I can get some on the cheap! 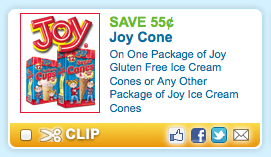 Head over and print this new $.55/1 Any One Package of Joy Ice Cream Cones coupon! Use zipcode 84121 if needed. You should be able to find the 18ct package at Walmart for around $1.19, meaning only $.64 after coupon! Sounds like a delicious deal to me!